A cash machine, also known as an automated teller machine (ATM) is an electronic telecommunications device that enables the clients of a financial institution to perform financial transactions without the need for a cashier, human clerk or bank teller. On most modern cash machines, the customer is identified by inserting a plastic ATM card with a magnetic stripe or a plastic smart card with a chip that contains a unique card number and some security information such as an expiration date or CVVC (CVV). Authentication is provided by the customer entering a personal identification number (PIN). What is meant by ATM card? 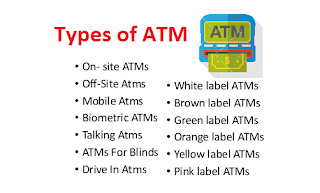 An ATM card is any payment card issued by a financial institution that enables a customer to access an automated teller machine (ATM) in order to perform transactions such as deposits, cash withdrawals, obtaining account information, etc. What are the different types of ATM? Worksite ATM-Is located within the premises of an organisation and is generally meant only for the employees of the organisation. 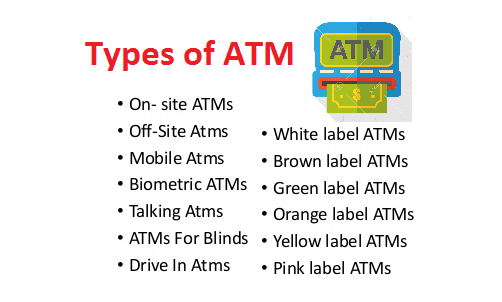 Mobile ATM- refers to an ATM that moves in various areas for the customers. Few priavte banks have introduced ATM on wheels. When was the first ATM invented? On September 2, 1969, Chemical Bank installed the first cash machine in the US at its branch in Rockville Centre, New York. The first cash machines were designed to dispense a fixed amount of cash when a user inserted a specially coded card.